Kaia Kush is a feminized hybrid combining two high quality cannabis genetics: Super Silver Haze meets OG Kush strain to get a productive and resinous cross with a strong effect. The Kaia Kush variety will show strong hybrid vigor giving excellent results in SCROG growing, but also in Sea Of Green systems reducing the vegetative stage to a short period, or even flowering without a vegetative period. 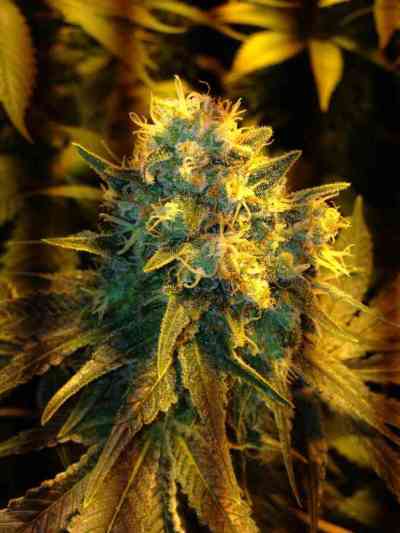 Its flowers will be large and very resinous, needing 9 weeks to get ripe, or early October for Outdoor growing. The exuberant blossoming of Super Silver Haze combined with OG Kush's floral density makes Kaia Kush very productive, being able to get yields up to 800gr/m2 when grown indoors and up to 1000gr/plant outdoors. The SSH x OG Kush genetic combination will also create a complex terpen's profile, mixing floral, acid and spicy tones on a sweet earthy background, while its cannabinoids contain a 19.8% THC level and some CBD and CBN making Kaia Kush useful to fight pain, for relaxing and for being creative.